Garden Planning Permission - What Do I Need It For? The way that gardens are used today has changed from the past. The garden area is often seen as land on which to create additional living space, becoming an extension of the home. The clever way of adding extra space without needed planning permission is with outbuildings. Larger plots of land offer opportunities to build multiple outbuildings under permitted development. 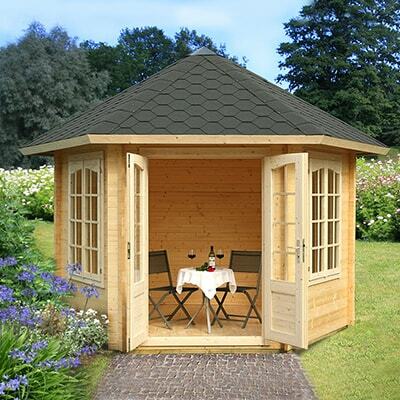 There are rules that govern outbuildings such as sheds, garages, greenhouses as well as other ancillary garden building structures like ponds, sauna cabins, swimming pools, kennels, and other enclosures like tennis courts. The following are general guidelines pertaining to these permissions, but it is important to understand that there may be different regulations that apply from different councils. Be sure the check with the local council for information specific to the area of concern. Outbuildings are generally considered to be permitted development, not needing additional planning permission as long as they fall within certain limits and conditions. This is of course if the building is less than fifteen (15) square metres and has no sleeping accommodation within it. Furthermore, buildings with between fifteen (15) square metres and thirty (30) square metres are generally exempt from the need to apply for building regulations. In this case also, the building must not contain any sleeping accommodation and must also be at least one metre from any boundary, or it must be constructed of materials that are substantially non-combustible. Under permitted development, the total area covered by these buildings and enclosures cannot exceed fifty percent (50%) of the total area of the curtilage. This area does not include the area covered by the main house but should account for any extensions. These outbuildings cannot sit forward of the principal elevation under permitted development. Planning permission is not required as long as the height remains within the terms given above. The key understanding of a garden building under permitted development, not requiring any planning permission is that the garden building is incidental to that of the main dwelling. This means the garden buildings cannot be used for residential accommodation. Please understand that this information is a simple summary of garden buildings that do not need planning permissions under permitted development. It is important to check with the Local Planning Authority before actually moving forward with a project to build a garden building. It is true that regulations under certain councils differ under other councils. Furthermore, some permitted development rights have been removed in certain cases. It is also a good idea to get a certificate of Lawful Development pertaining to any garden building in case the property is every up for sale to ensure the garden building falls within the criteria of permitted development.